Many of those about to be vaporized did not grasp the fragility of the “prosperity” they assumed was both solid and permanent. Business-cycle recessions are not just inevitable, they are necessary to flush bad debt and marginal investments/projects from the system. The next recession–which I suggested yesterday has just begun–will be more than a business-cycle downturn; it will be a devastating meteor storm that destroys huge chunks of the economy while leaving other sectors virtually untouched. The dynamic that’s about to play out is simple: wages for the bottom 95% have gone nowhere for 17 years, while costs have soared far above official inflation for everyone exposed to real-world costs. We have filled the widening gap between stagnant household income and rising expenses with debt. This stop-gap works for a while, but eventually the cost of servicing debt consumes the entire budget, leaving little to nothing to save or invest. Absent savings and incentives for productive investment, productivity falters once productivity falters, wealth is no longer being generated or distributed widely. After eight long years of filling the widening gap with borrowed money, the jig is up: the returns on adding debt have diminished to zero, and the financialization games that were supposed to be temporary emergency measures are now permanent. 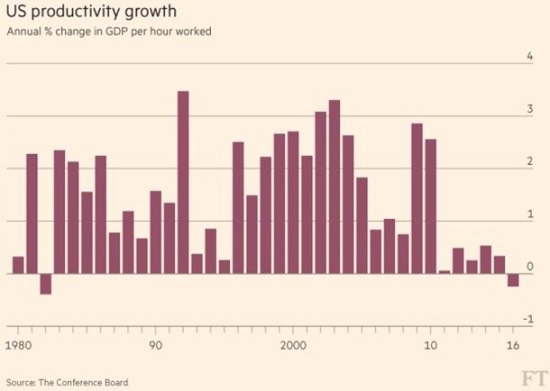 Like a field exposed to toxins for 8 long years, all this permanent monetary and fiscal stimulus has weakened the productive economy while causing the most destructive weeds to flourish. When credit expansion stops, the effect is like a meteor storm: marginal borrowers and lenders crater, and every sector that depends on marginal borrowers and lenders for sales and profits also craters. Those sectors that are heavily in debt and dependent on marginal borrowers for sales implode once sales slump. As these enterprises default, all the lenders who issued this commercial debt also blow up. Every node of the economy that is heavily indebted and dependent on marginal borrowers for sales, profits and taxes will be struck by a financial meteor. Every sector that avoided debt and sales funded by debt will escape with only light damage. 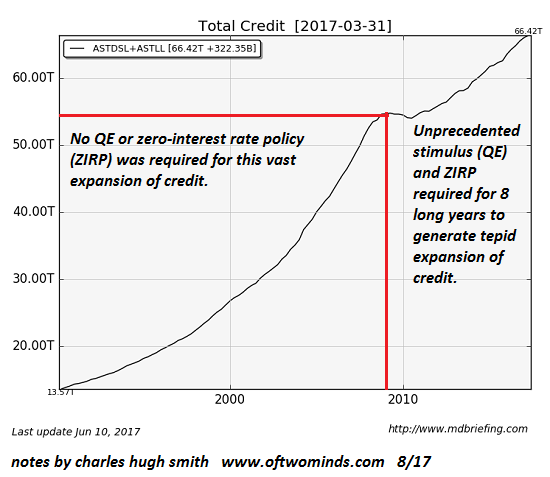 Here’s total credit in the U.S.: up from $26 trillion 2000 to $66 trillion today.The $12 trillion increase since 2009 required trillions in monetary and fiscal stimulus and hundreds of billions of dollars in savings diverted to the banks via zero-interest rate policy (ZIRP). While explode higher, wages for the bottom 95% stagnated. 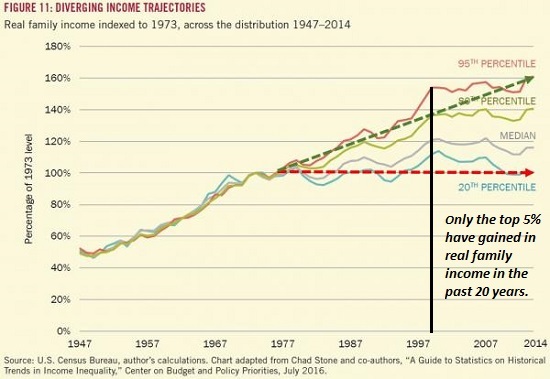 Only the top 5% of households experienced any real (inflation-adjusted) income expansion. Many of those about to be vaporized did not grasp the fragility of the “prosperity” they assumed was both solid and permanent. The difference between earned income and sales derived from earned income and debt-based income and debt-based sales is about to become painfully clear: the coming financial meteor strike will vaporize debt-based activity and leave whatever isn’t dependent on debt relatively unscathed.